© The St. Regis Washington, D.C. The St. Regis Washington, D.C. is well-known for their impeccable customer service and excellent location, only two blocks from the White House. Guests include well-known dignitaries, royalty and discerning travelers from all over the world. There are 172 guest rooms and suites available, which include several different categories. Guests staying in suites have access to full butler service during their stay. The hotel features an Afternoon Tea Ritual as well as champagne. Guests looking to enjoy fine dining will love the on-site dining at Decanter. The hotel is grand and luxurious and perfect for anyone looking for a top-rated, award-winning hotel in close proximity to downtown Washington. Of the 172 rooms and suites, guests can select from several different categories. The rooms and suites are designed to accommodate from two to four guests, depending upon which option is chosen. Each room features elegant décor, luxurious bedding and flat screen televisions for in-room entertainment. The private bathrooms feature brass fixtures and spa-inspired bath amenities. The Superior Room is approximately 350 square feet and is available with a king bed only. This room is perfect for a couple traveling together, and is the base room category. 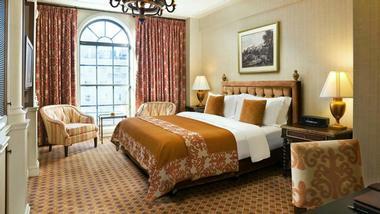 Other room categories include the Deluxe Room, Premier Deluxe Room and Grand Luxe Room. Each a little large in square footage than then other. The Grand Luxe Room comes with a sleeper sofa as well, for an additional guest. The suites available at St. Regis Washington are a home away from home, with access to butler service and the hotel car. The base suite is the Metropolitan Suite, which sleeps four guests and features 620 square feet of space. There is a king size bed and a double size sofa bed. The bathroom is oversized, perfect for four guests sharing a suite. These suites are available as adjoining rooms to Deluxe rooms should guests require a separate room for children traveling with them. Other suites include the Caroline Aster Suite, The St. Regis Suite, Empire Suite and the Presidential Suite. The Presidential Suite boasts over 2500 square feet of space and sleeps up to four guests. This suite is lavish, luxurious and superior in every way, from the Italian beading on the walls to the French trims and tassels. There is a parlor area for sitting and relaxing as well as a private dining room. This suite comes with a Butler Pantry and full butler services. The master bedroom has a connecting library, which makes for an ideal meeting place for intimate gatherings. No luxury is spared in the Presidential Suite. Decanter is the on-site restaurant at St. Regis and serves haute American cuisine for breakfast, lunch and dinner daily. It features grand décor with high ceilings and soft, elegant furnishings. The menu is French cuisine inspired along with European flare, all tied in to American classics. Breakfast choices include simple items like Greek yogurt or steel cut oats, all the way to American Breakfast with eggs, sausages, pancakes and more. Guests looking for a gourmet flare can try the Scottish Smoked Salmon Benedict or Buttermilk Belgian Waffle with Nutella swirl. Lunch is served only Monday to Friday and features simple light, lunch fare to full entrees such as angus steak or chicken breast. Dinner is an upscale experience with starters such as Meyer Lemon, Tuna Tiradito or Seared Scallops, followed by a delicious selection of entrees including Domestic Lamb or Rabo de Toro (Boneless Oxtail) and various cuts of steak. Dessert comes with its own extensive menu, one that is sure to tempt anyone even after a filling gourmet meal. Afternoon Tea is served at St. Regis each day and guests can opt to join in for a per person charge which includes sandwiches, desserts and scones, plus tea. 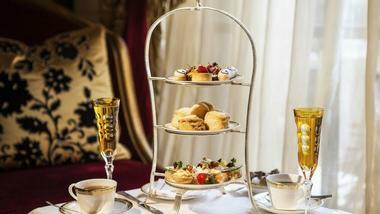 For an additional charge, champagne service can be added to the Afternoon Tea ritual. Room service is available to guests 24 hours a day. The menu varies depending upon what time of day it is, however, there is food available to be ordered all day long. The St. Regis Bar & Lounge is comfortable, sophisticated lounge to sit back and enjoy a drink with colleagues or companions alike. Guests can move easily between the hotel lobby and the bar with couches and chairs for seating and ambient lighting to set the mood. The bar features a warm, inviting fireplace which is perfect to cozy up to and enjoy a classic drink or sip a glass of wine. Guests looking for small plates or appetizers to enjoy, The St. Regis Bar has a bar food menu to choose from. While there is no spa on-site at St. Regis Washington D.C., guests will find spa services a very short distance away at Piaf Salon and Day Spa. Piaf offers not only cutting-edge hair service but also day spa treatments fit for a King or Queen. Clients include business travelers all the way to world dignitaries. They feature an extensive Facial menu, including one specifically for gentlemen. Guests can enjoy manicures, pedicures and make up application as well as a range of massage options. Piaf has everything guests need to pamper themselves and enjoy a day of relaxation. Located a short 20 minute drive from St. Regis, Langston Golf Course is a public golf course, with family tees to accommodate golfers of all skill level. There are 18 holes, however it can be played as a 9 hole course as well. It is the only public course in Washington with water hazards, making a round of golf exciting and fun. The course is a par 72 with two holes over 500 yards and par 5. There is a pro shop on-site for all guests golfing needs as well as a clubhouse to enjoy a drink or a bite to eat before or after golfing. Driving range facilities are available if guests are looking for a little practice beforehand. At St. Regis Washington, D.C. there is a Kids Club for younger guests to enjoy. Families are welcome at The St. Regis and will enjoy the spacious rooms with sofa sleepers to accommodate children in-room with their parents. If the children are older, parents may wish to reserve adjoining rooms, which are also available, to allow for more space and additional privacy. In-room, children will love the child-sized robes and slippers as well as the step stool to help reach the sink. The concierge has developed a special Scavenger Hunt just for families, which is an exciting activity for all family members to participate in. There are many activities and attractions in the area for families to enjoy as well. Nearby, families will enjoy the Smithsonian National Zoological Park. There are a great variety of animals to view as well as activities on-going for kids ands adults alike to participate in. If guests are looking for a cultural, yet fun experience for the family, they could consider the National Geographic Museum. 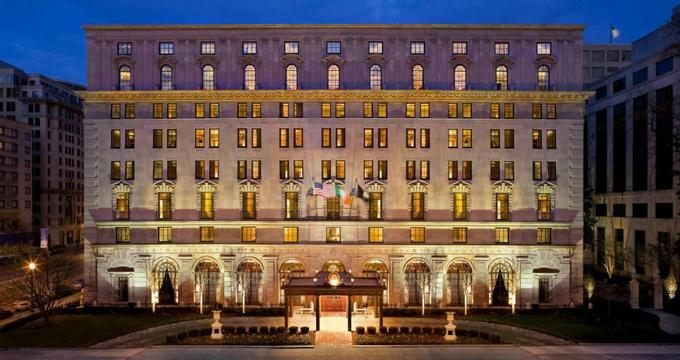 Couples looking for an ultra-luxurious wedding experience, The St. Regis Washington, D.C. is the ideal place. The dedicated planning staff offer the highest level of attention to detail from the first meeting to final hours of the big day. 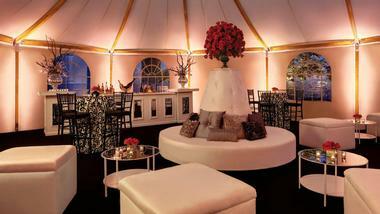 The Astor Ballroom is a much sought after venue to host grand receptions and features over 2500 square feet of space. The stunning chandeliers and majestic windows add to the elegance and grandeur of the space. Ceremonies are beautiful and private on the Astor Terrace which can be covered with a soft, translucent covering in case of weather concerns. The hotel’s chef works alongside each couple to develop a custom menu, perfect for their day and superior in quality. All other details from flowers, to décor to the cake are all considered with the wedding planning co-ordinators as St. Regis. Corporate guests looking for an upscale option for conferences or meetings, should look no further than St. Regis. They offer state of the art audio visual equipment to enhance any seminar or conference as well as elegant, professional meeting spaces. Customized menus are available to cater to each meeting as needed and preferred. The dedicated event staff will see that no detail goes unnoticed. Guests may be surprised to learn that The St. Regis is a pet-friendly hotel, since most hotels of this calibre are not pet-friendly or even family-friendly. Pets are welcome for an additional charge per night. Pets are provided treats, special dining mats, feeding bowls and doggie toys. Guests have access to bicycle rentals at the hotel for their pleasure as well as transportation services to and from local destinations using the hotel car. The concierge is happy to arrange these transportation options for guests. For business travelers, the business center and services are available 24 hours a day making doing business a breeze from the comfort of the hotel. These services include Internet access, fax, photocopying and email. St. Regis Butler Service is another special feature of the hotel, which is offered to all guests. A higher level of butler service is provided to guests staying in the suites. This service means any requests a guest may have they can direct to the Butler service and they will do their best to meet that request. 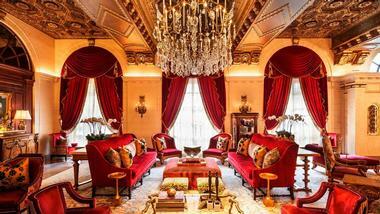 Guest Accommodations, Photo: The St. Regis Washington, D.C. Dining, Photo: The St. Regis Washington, D.C. Amenities, Photo: The St. Regis Washington, D.C.
Plan Your Visit, Photo: The St. Regis Washington, D.C.
Cover Photo: The St. Regis Washington, D.C.